SEA level is rising, but only in parts of oceans. 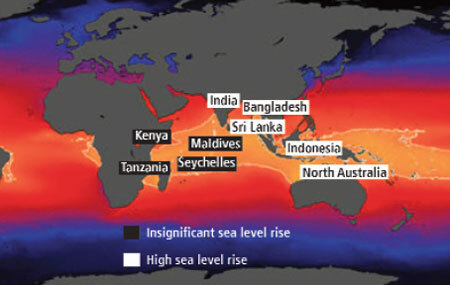 US researchers have said certain countries across the Indian Ocean, including Bangladesh, Sri Lanka and Indonesia, and Bay of Bengal would see higher than the average sea level rise predicted by UN’s Intergovernmental Panel on Climate Change. On the contrary, low-lying areas like Maldives, Seychelles Islands and eastern coasts of Tanzania and Kenya would not go under water, as predicted, because of insignificant rise of the sea level. “Sea level rise is not globally uniform but regionally variable,” said Weiqing Han from University of Colorado, who led the research carried out with the National Center for Atmospheric Research (NCAR) in Colorado. The researchers studied sea level measurements around the Indian Ocean since the 1960s and estimated that it is rising at 12.9 cm per century, but in a distinct pattern: the sea level is falling in the southern tropical Indian Ocean and increasing elsewhere. The key player in the process is the Indo-Pacific warm pool, an oval-shaped area spanning the tropical oceans from the east coast of Africa to the International Date Line in the Pacific. The pool has warmed by 0.5oC over the past 50 years, primarily because of global warming. This has strengthened two major atmospheric circulations—Hadley and Walker circulations— that affect the sea levels, they said in Nature Geoscience on July 11. As the surface water heats up in the tropics and rises, it hits the atmospheric barrier at the stratosphere and spreads out towards the poles. The air cools as it reaches the subtropics and begins to sink, pushing the cooler surface air, and in turn the surface water, towards the equator. This forms the Hadley circulation. The Walker circulation follows the same mechanism in east-west direction. Both ocean dynamics combine to form an uneven sea level pattern, such that water piles up west of Sumatra with less water near the Maldives, said Gerald Meehl of NCAR, co-author of the study. Unlike a bathtub, water in the ocean does not spread evenly. As ocean heats up due to global warming, it expands and raises the sea level. Global warming also intensifies ocean dynamics, pushing more water in certain directions. “These factors should be considered for reliable regional sea level and climate prediction,” Meehl said. Warming-induced Hadley and Walker circulations can have far reaching impact on Asian-Australian monsoons, intensifying floods in Indonesia and aggravating drought in Africa. India will suffer due to sea level rise, he added. Most areas in the Sunderbans are less than three metres above mean sea level. Rising sea level can be catastrophic for the 4.5 million people living there, said Subrata Sinha, former chief of the Geological Society of India.